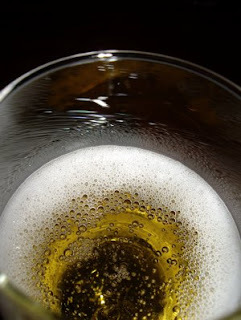 Enjoy - Food & Travel: 2008? Allons boire Champagne!! I admire clever people, and some of the most clever people are the population around Reims and Épernay. They make us feel special when we pay two to three times more for the sparkling wine produced in their region than similar wines produced elsewhere in Europe or the world. Why? Parce-que on boit Champagne, pas du vin mousseux. Because you are drinking Champagne! Clever, as Champagne is not that much better than many other sparkling wines. 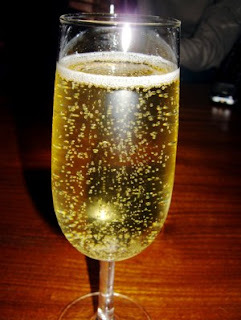 You may drink a Spanish Cava or an Italian Prosecco, and they are equally refreshing. Well I do not know whether we were easily fooled but we opened a bottle of Champagne as we entered the new year, and it tasted great. 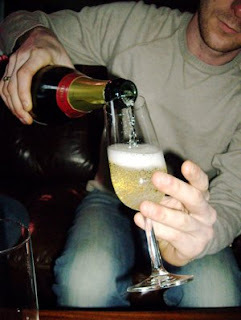 It was not a bottle of Krug, Moët & Chandon, Veuve Clicquot, Lanson, Taittinger, Bollinger or another high class champagne. This was Bonnet Grand Réserve, brut, a low class variety for sale at around €25. Well that did not worry Stian that eagerly started to perform, not the Japanese tea ceremony, but rather the Trysils Champagne Ceremony. The nectar was slowly poured into tall white wine glasses. Formally the ceremony would have required the coupe, the shallow and wide glasses to be authentic. And where was the Beluga Caviar? No caviar! Well, we still waited in suspense. A fresh blend of 60% pinot noir, 30% chardonnay, and 10% pinot meunier. A distinct bouquet of citrus and green apples. A taste of fresh fruit with some mineral. As good as some of the more expensive varieties I have enjoyed in my time. 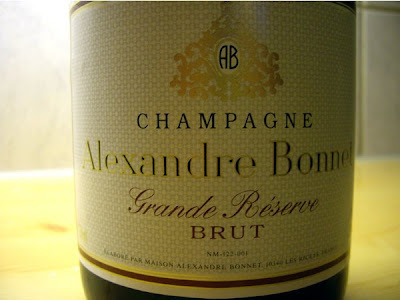 So if you would like the real McCoy, without paying too much Bonnet Grand Réserve, brut is a good alternative. So the farmers from Épernay managed to fool us once more.